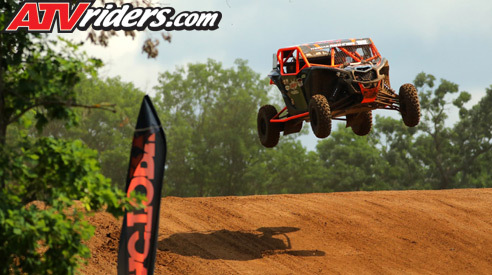 Connellsville, PA (7/26/2018) - BAK40 Motorsports, with drivers Tim Farr, Eric Gordon, and Thomas Reihner, came together and fought adversity as a team during the Lucas Oil Midwest Short Course League races at ERX Motor Park in Elk River, MN. 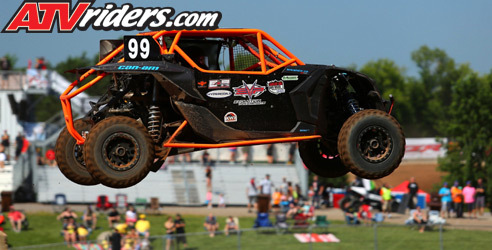 The team is running Can-Am Maverick X3s in the Pro Modified SXS classes. If the series offered a hard charger award, Farr would have earned it and then some during the weekend. After debuting a new car for the event, a technical issue sidelined them. In true team spirit, Gordon offered up his car for Farr and spotted for him during the races. In Friday’s race, Farr started at the back of the field and flew through the field several times, only to be sidelined by cautions and sent to the back. The carnage-filled race was shortened to six laps and despite the short time, Farr’s veteran skills propelled him to a fifth-place finish. In Saturday’s race, Farr took third into the first corner before several cars plowed into his Can-Am. He settled back for two laps to assess his car, and then began moving to the front. While challenging for third, he made incidental contact with another car and racing officials black flagged him. Despite having to restart at the back of the field with only a few laps left, Farr recovered to finish 11th. Despite the questionable calls, and difficulties during the weekend, Farr was happy with the way his new BAK40 team handled the difficult weekend. Farr is now fourth in points with a lot of racing left and he knows he and his team will rebound. Despite mechanical issues, Reihner put in several hard charges and even led two laps of Friday’s race. He appreciated being able to prove to himself that he had what it takes to run up front. The combination of his proven Can-Am X3, along with his Double E Suspension tuned by George White and CST Tires worked perfectly on ERX’s tough and technical track. BAK40 is not backing down. The team is ready for redemption when the series heads to Bark River International Raceway for the next Midwest Short Course racing weekend August 10-12.